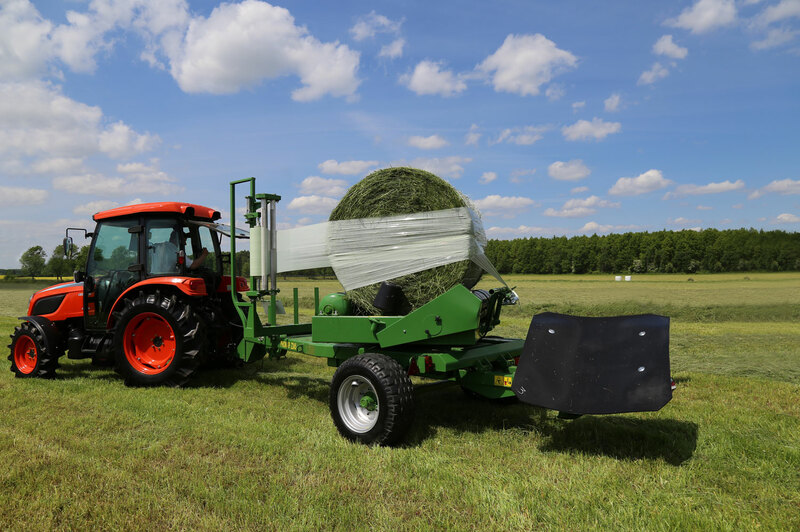 The greatest level of attention of grassland landowners is drawn by grassland development machines: disc mowers, rotary rakes, bale wrappers, rotary tedders, round balers, and fertilizer spreaders. This is due to the fact that these machines provide the highest level of acceleration for farm tasks and reduce the amount of physical labor. 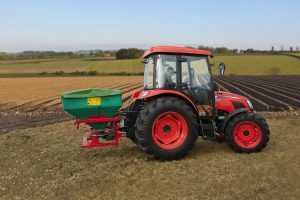 Fertilizer spreaders are machines required to supply green fodder in the spring. Pronar manufactures the following types of spreaders: FD1-M03L, FD1-M05L, and FD2-M10. They are single- and double-disc machines featuring simple operation and high durability. The advantages of the first two models include very attractive prices and lightweight design, facilitating aggregation with low power tractors. 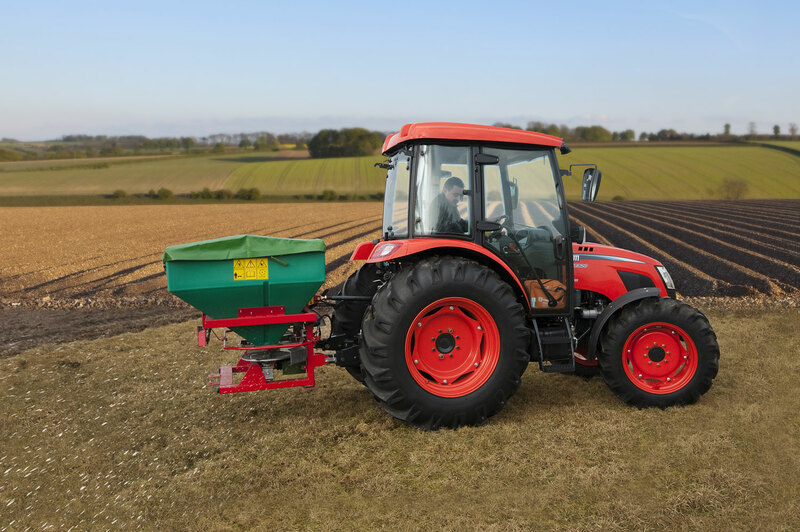 Thanks to appropriate profiling of the disc, the spreading width of the fertilizers can be set up to 14 m, and the dosing process is controlled with the help of a lever operated from the tractor cab. For FD2-M10, it is designed for farms requiring machines featuring a higher level of effectiveness. It is equipped with a two-chamber and double-row hopper featuring 1000 kg capacity and 10 to 24 m spreading width. Green fodder harvesting, including grasses, must precede haymaking. 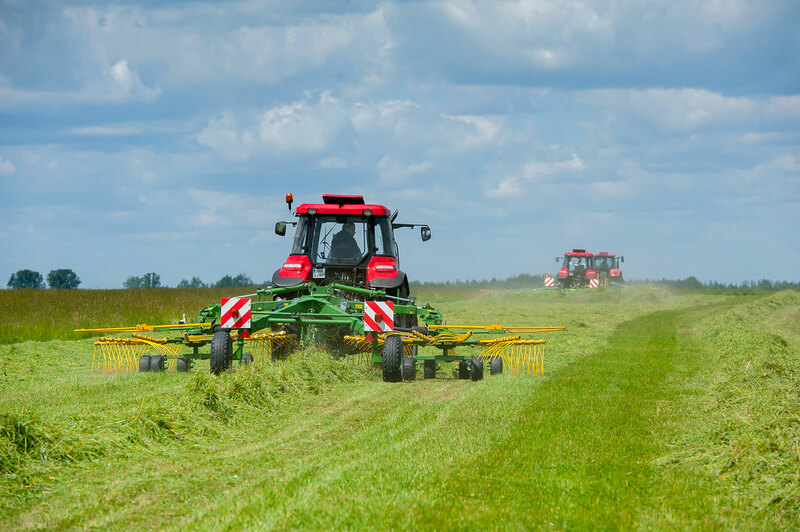 Hence, the comprehensive offer of Pronar, facilitating the selection of the machine best fitted for a given farm area and tractors operated in the area. Pronar rear-mounted disc mowers – PDK220, PDT260, PDT300, and PDT340 – are built over a heavy-duty PRONAR cutter bar with an additional stiffening profile enclosed in the cutter bar body. The optimum capacity of oil pans of the bars provides their proper cooling. The bars are also equipped with a quick blade replacement system and protective skids to prevent the blades against abrasion. Our offer also includes disc mowers fitted PDT260C and PDT300C with a conditioner designed to accelerate the grass stock drying process by destroying the wax layer accumulated inside the stalks. This, in turn, eliminates the need for frequent operation of the tedder, thus reducing fuel and labor costs. 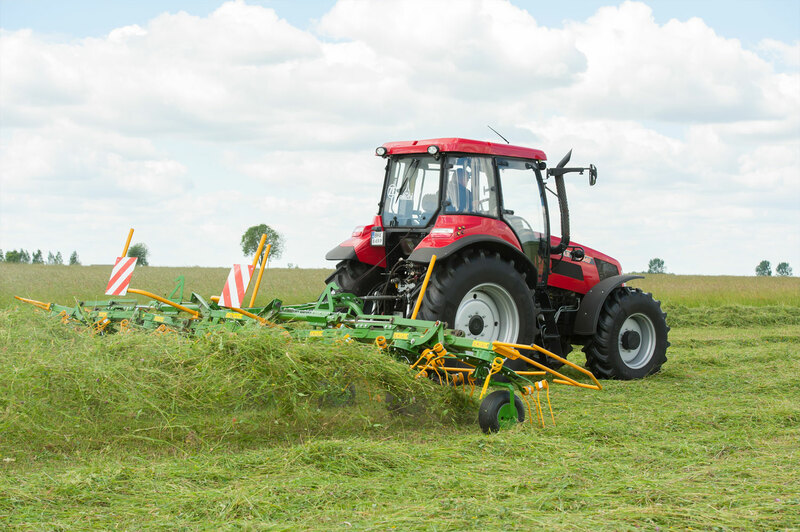 In addition to the disc mowers mounted at the back of the tractor, Pronar also manufactures front mounted machines: PDF300, PDF300C PDF301, PDF301C, and PDF390. 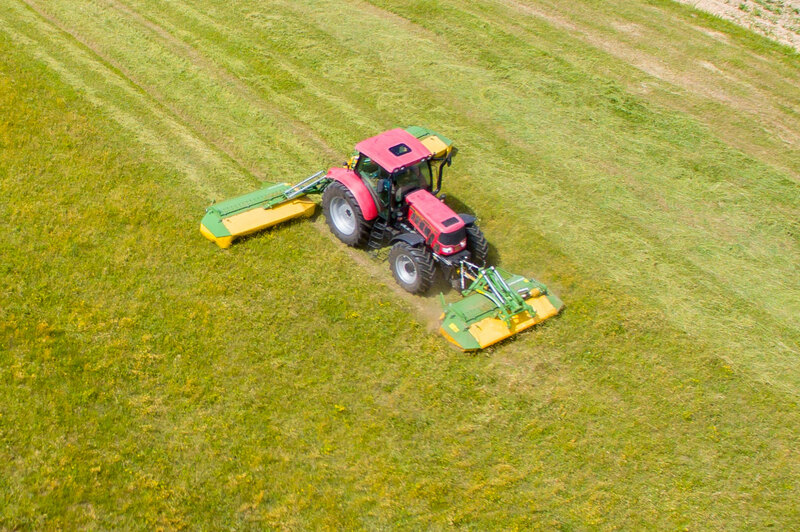 For farmers with extensive areas of grassland, Pronar offers a highly efficient range of rear mounted disc mowers PDD830 and PDD830C and a front mounted mower PDF300. The PDD830 and PDD830C mowers include two cutter bars (each featuring 3 m working width) mounted on a single frame. A hydraulic protection system is designed to protect the machine against damage in case of driving over an obstacle. After coupling the two front mowers with the front mounted PDF300, the swath width of the entire set is up to 8,3 m.
In case grass requires drying, it must be overturned, and Pronar PWP460, PWP530, PWP770, and PWP900 are just the machines designed for this purpose. They feature a solid design, simple operation and interaction with any tractor equipped with cat. I and II suspension system. The number of fodder spreading carousels depends on the width of a given model and ranges from 6 to 8. Working arm are ended with flexible tines that are the same for right and left turns. Transmissions in Pronar tedders are maintenance-free, tight sealed and lubricated with a permanent lubricant (oil bath). Mowed, spread and dried grass is suitable for harvesting. To facilitate this task, the grass needs to be raked. Pronar rotary rakes: ZKP300, ZKP350, ZKP420, ZKP460T (with an articulated drawbar), and ZKP800 (with two carousels) featuring working width of 3 to 8 m are particularly suitable for the job. Pronar rotary rakes are high-efficiency machines featuring simple design and operation and providing an option to interact with the majority of tractors currently available on the market. Similarly to tedders, Pronar rotary rake design relies on tight sealed, maintenance-free gears lubricated in an oil bath. Increasing working width of a given model increases the number of raking arms (from 8 to 12) with three or four double tines mounted on each arm. Pronar rotary rakes provide a comprehensive ground following ability associated with precision raking of mowed material. 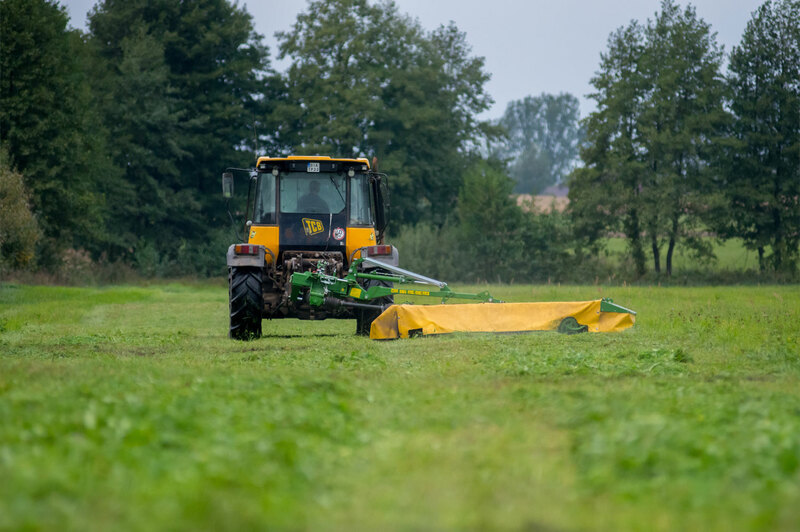 ZKP800 features outstanding performance and functionality thanks to a 7 – 8 m working width adjustment system powered from the tractor. In addition, the tractor hydraulic system allows the machine to be folded to facilitate its transportation. 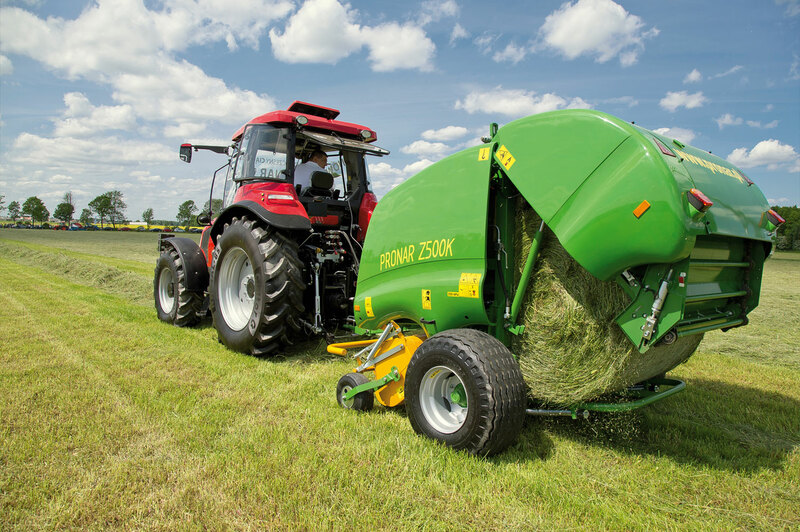 Another important group of machines designed to assist grass harvesting are round balers. Our offer includes Z500K, Z500R, and Z500G. These are fixed-chamber, cutting-edge, high-efficiency machines providing top-level compression of harvested material (straw, hay and green fodder). PRONAR Z500G provides top yield levels when harvesting grass and reed from wetland and swamp areas. The applied caterpillar tracking system ensures failure-free movement around a terrain of this type. Z500R is equipped with a rotary green fodder shredder and a pick-up header featuring a working width exceeding that of the Z500K (2035 mm). When it comes to bale wrapping, Pronar Z245 and Z245/1 bale wrappers prove to be extremely useful at the final stage of the animal feed preparation process. The former is fitted with a side loading arm allowing the operator to load bales without stopping. Equipping the wrapper with wrap counter and hydraulic control system allows the operator to adjust operation parameters from the tractor cab (an option to order a machine with an electric control system is also provided). Contrary to Z245, the latter machine (Z245/1) allows the operator to operate the front bale grapple system. It enjoys an outstandingly good reputation amongst farmers with limited freedom of maneuvering a tractor with a machine (e.g. narrow or short plots).